Hi All! 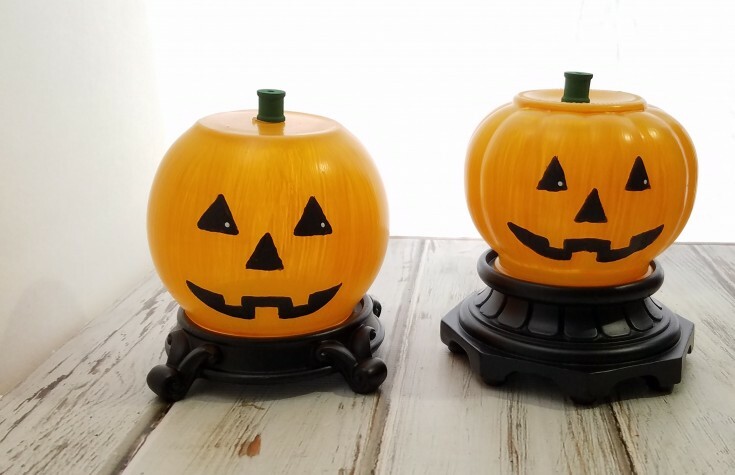 Are you ready for some adorable Halloween Jack-O-Lantern Lamps? 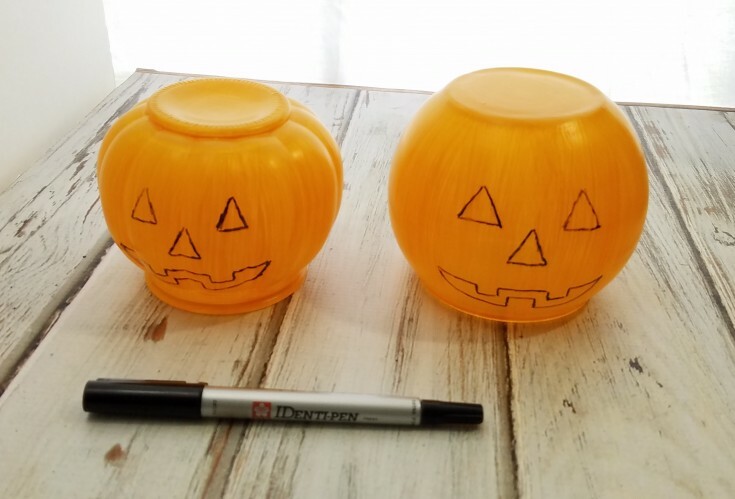 After seeing the Jack-O-Lamps at Sadie Season Goods I had to make some for the grand kids. Only one problem, I couldn’t find the items needed for the Jack-O-Lanterns. Stopped at several Goodwill’s, Habitat for Humanity Restore, and other thrift stores. NO luck! When I was about to give up I found a couple of small round vases that I thought would work, if I could find a base. I was in luck! I found two candle holder bases that the glass dishes fit in perfectly upside down. Still one Halloween lamp short, then a few days later I found a round globe at Goodwill. It must be my lucky day, because I also found a candle holder that was a perfect for the globe. First started off by spray painting the candle holder bases black. While that was drying I mixed up some Mod Podge, and orange acrylic paint for the Jack-O-Lantern lights. Adding two coats to each Halloween lantern letting each coat dry thoroughly. Back outside to give the bases another coat of black spray paint. Next, I used a paint marker to draw off the faces on the Halloween lights. Then I filled the face in with black paint. Using my stylus pen (a toothpick will work as well) I added the white dots to the eyes. 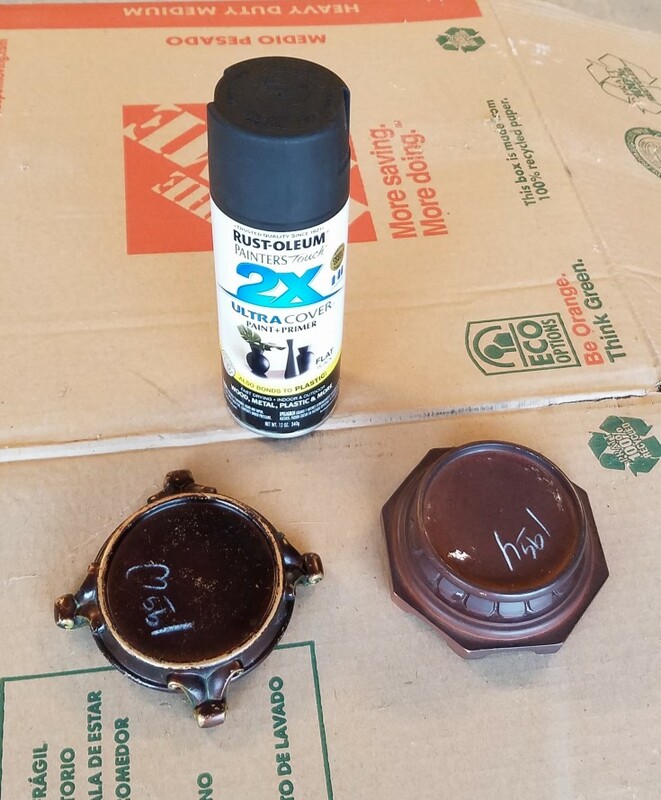 Once the glass lanterns were dry I added an extra coat of MP for protection. 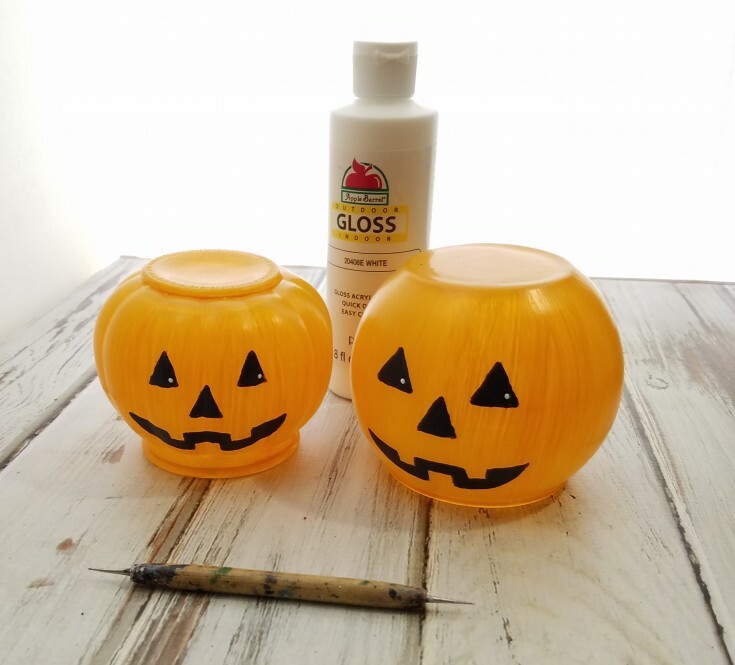 For the two smaller ones, I painted two small wooden spools green then hot glued them on top of the Halloween Jack-O-Lantern lamps. The larger of the Halloween lamps I left as is. I was afraid that a spool wouldn’t stick very well because of it being rounded on top. 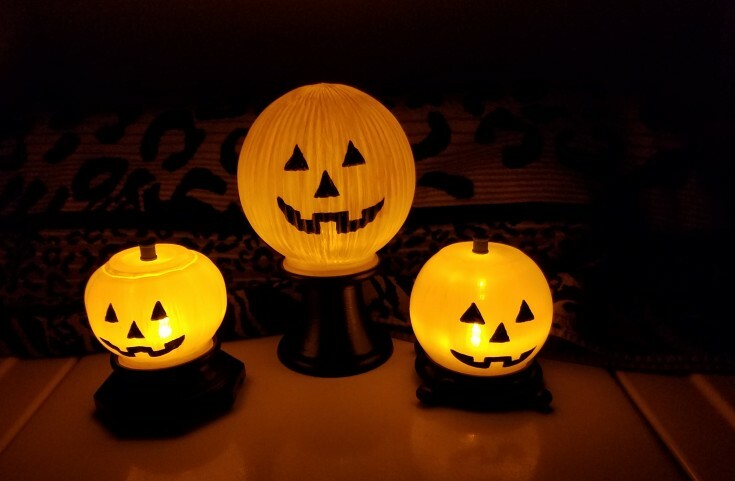 Now all I have left to complete my repurposed Jack-O-Lantern lamps is to add the Led lights to each base, and position the pumpkin heads on top of each base. That’s it! aren’t they absolutely adorable? The grandkids LOVED them! 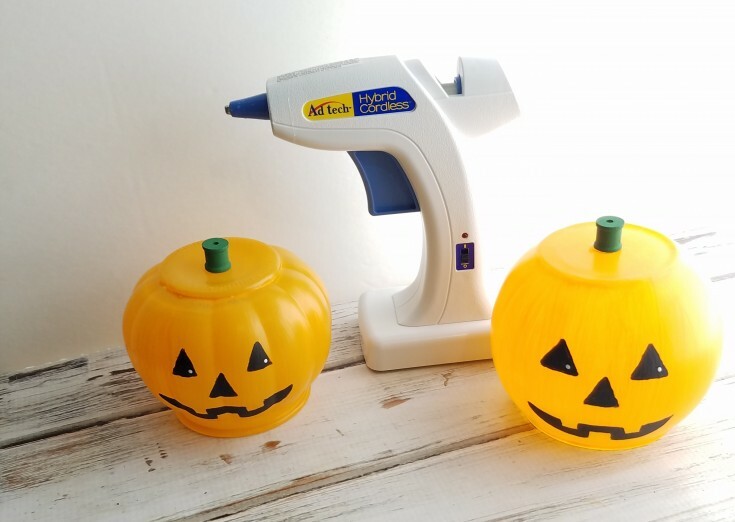 More Halloween Craft Projects You May Enjoy! Thank you Michelle! You should of seen my two year old granddaughter, her little face lit up, she loved them. Kept running in the other room to see them. Linda! This is adorable! I can see why the grandkids loved them! Super cute repurpose! Adding to the list of things I’ve got to try. Thank you Florence! I almost gave up because I couldn’t find what I was looking for. I’m so glad I kept looking till I found something that would work. They really are adorable Linda, and your grandkids will be able to get them out year after year which is so cool! Thank you Sarah! The grandkids loved them, the two year old kept running in the other room to see them. Thank you Amy! Since you love decorating you should make some. Their super easy and cute. Wow! 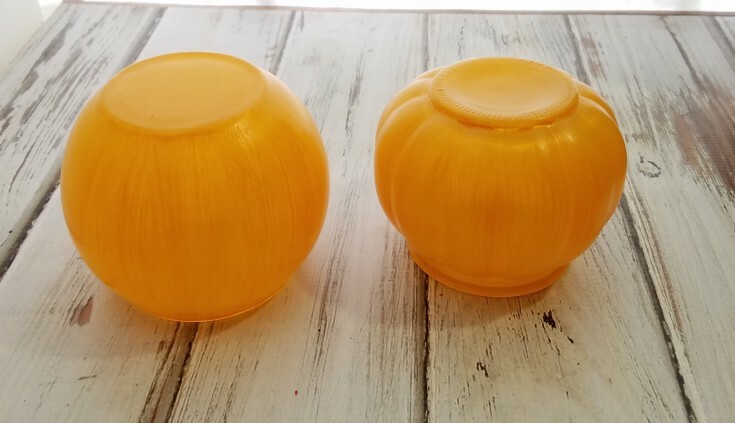 I never would have thought of using vases and candle bases! They are so cool. I bet the grandkids loved them, they are so fun. I never would have guessed that they were a DIY! Those are the best kinds of projects. Thank you Nikki! The kids really loved them especially the 2 year old. Last years was a mummy lantern. Your grandkids are so lucky to have you Linda, these are the hit!! They are so so much fun and you´re so clever! Thank you Katrin! I got the idea from Sarah at Sadie Season Goods, I just couldn’t find the items she used so I compromised using other items. These are so great! Your search paid off. 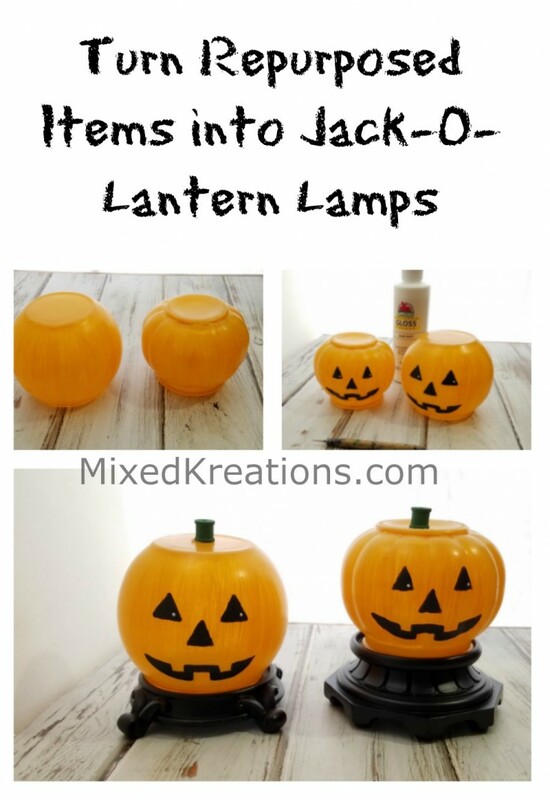 These are perfect for jack 0’lanterns. Pinned to my Halloween board. Thank you Beverly! I am glad that I didn’t give up my search. Thanks for Pinning!